It may seem strange, but floors are one of the first things that buyers will look at upon entering a property. 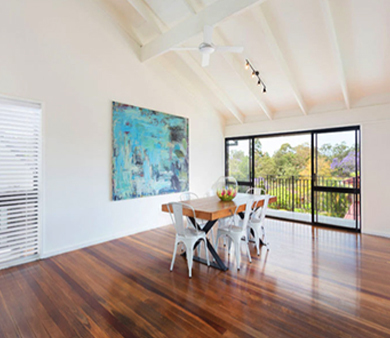 Restoring and polishing your timber floor before you decide to put your house up for sale can really rejuvenate a home and allow it to stand out in a competitive market. The lovely couple were looking to lift the appearance of their polished floors to increase the chances of a generous offer for their spacious home. We worked closely with the client’s interior decorator and decided on a lower sheen Satin Polyurethane Finish to tie in with the modern décor and colouring throughout the home. This satin finish gives a lovely warm sheen to the floors. This finish has a relatively low luster, meaning it reflects a small amount of light off its surface. This helps to hide small imperfections and dirt that may be on your floor, making it a great option for a high-traffic home with children. Our team completed this job in two stages. We enjoy working closely with other tradesmen when coordinating a successful house renovation and patience is a key ingredient to finishing the job. We must ensure all other trades have been completed before we can begin to finish polishing off the large areas in the home. The result was a sleek and understated look with a modern feel that a lot of homeowners love. It wasn’t long before this hot property was snapped up and off the market, much to the delight of the owners. Another successful and flawless timber floor restoration by DR Main Floors.